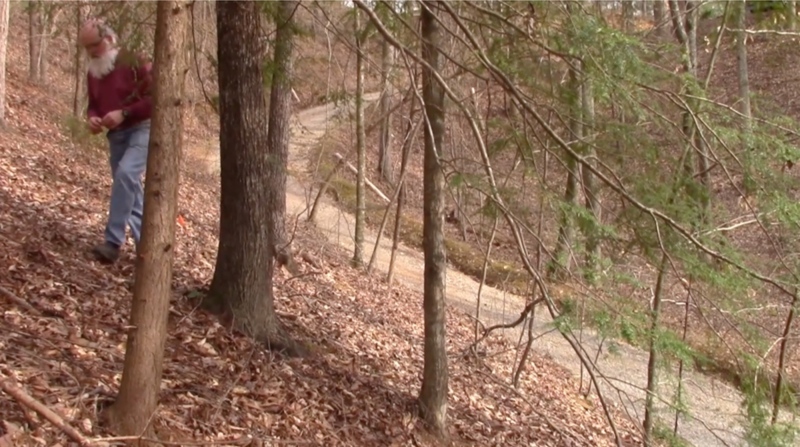 CLINT BANCROFT resides on 18.5 acres of sloping woodland not far from Chattanooga TN. 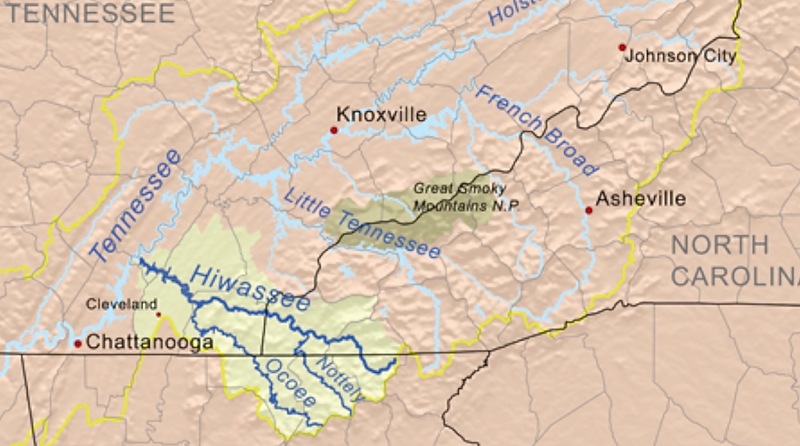 The Ocoee drains into the Tennessee River Watershed (see maps below). Clint Bancroft shows Connie Barlow the 9 Florida Torreyas he has planted on his 18.5 acres in southeastern Tennessee (plus 2 more in pots). At 1,100 ft elevation, and in a mixed deciduous/conifer forest, all the Torreyas look healthy. In closing, Connie gives Clint 40 seeds from the fall 2014 Torreya Guardians' harvest. 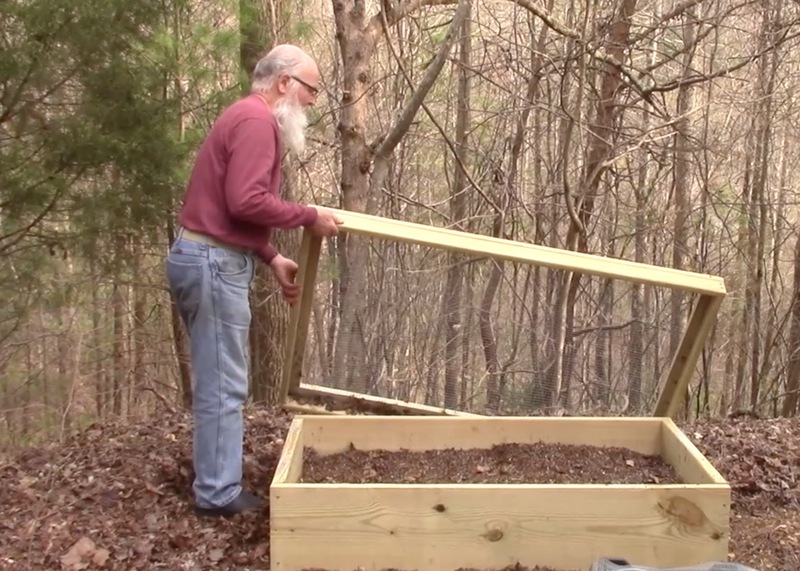 Clint demonstrates his rodent-proof outdoor shelter for germinating those seeds. 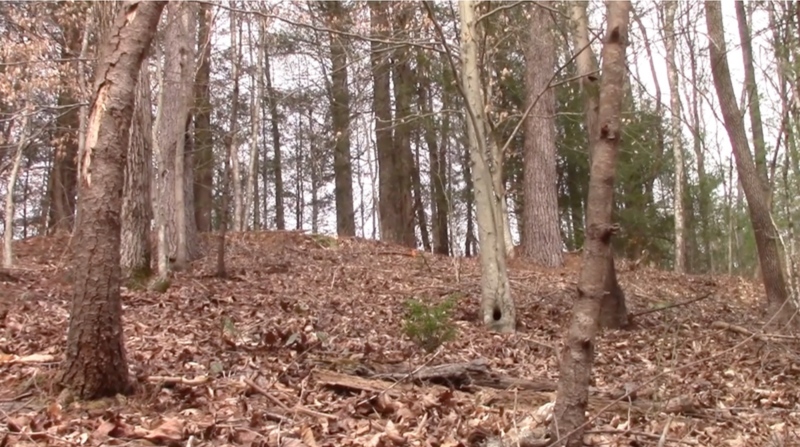 19 minute VIDEO - filmed March 2015. BELOW: Two woodland seedlings where some of the 9 torreyas were already planted. LEFT: Clint demonstrates his rodent-protected box for germinating Torreya seeds in soil outdoors. CLINT WRITES (Dec. 2014): "I am trying to establish a preserve of rare SE plants on my TN property. 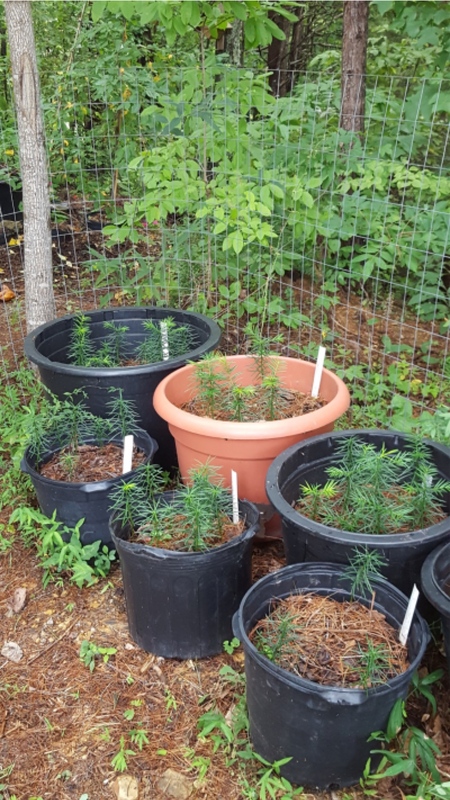 I have no idea of the history of the 11 potted seedlings I already obtained (prior to contact with Torreya Guardians), except in a very general sense. My first tree is now about four or five years old and was purchased as a gift to me by a friend in Pensacola, FL (from an unknown nursery in Tallahassee). I was told that first tree is a male. The remaining 10 came from Woodlanders in Aiken, SC, and are about two years old now. I have no idea if any of those are seed-grown or rootings, but all are doing well. Woodlanders wasn't sure of the answer to that question, but I believe those ten are all from rootings off the tree in the Aiken Arboretum. I believe that tree is male. If they are from that one tree I have ten genetic clones. I have one that has two leaders/trunks." 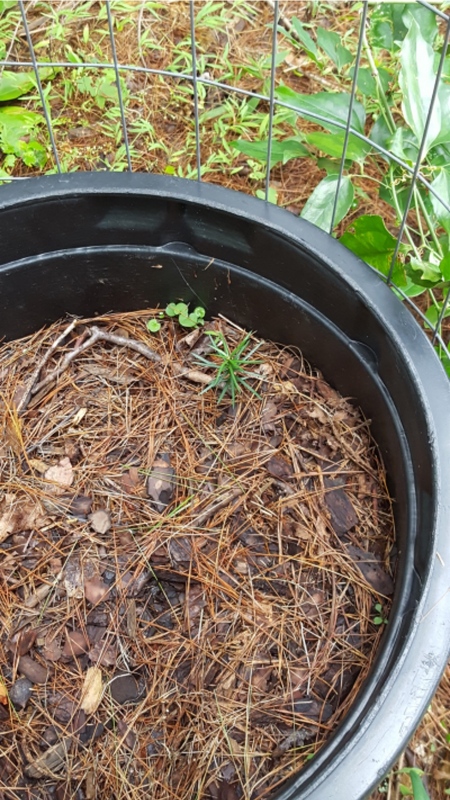 June 2015 email: "When you visited in March you surmised that my little trees that I set out last summer were resting while they put down a taproot. Apparently they had just not awakened from winter. All of them have put on new lateral growth and even more exciting vertical growth. They are thriving with just ambient rainfall  with the exception of the four I can reach with the hose." Jack gave Clint 150 seeds from the 2015 fall harvest, 91 of which were floaters (which Clint planted separately in order to keep track of any differences in success between floaters and sinkers). RESULTS (reported May 2017): "These were seeds from Blairsville given me by Jack Johnston in 2015. I did not record any counts, but as expected, there was a significant difference in germination between floaters and sinkers. The first germination came only 7 months after planting outdoors. That was a pleasant surprise  and the floaters germinated in significantly higher numbers than the sinkers. Interesting! Counterintuitive! Bottom line: Don't give up on your floater seeds." 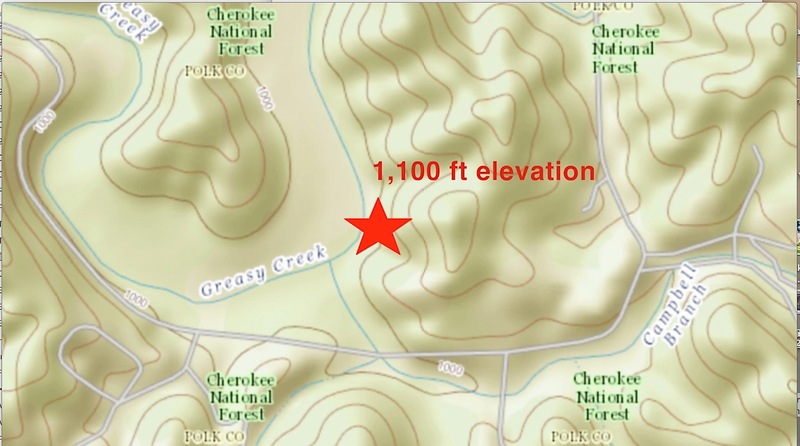 June 18, 2016 email: I have had great success in Greasy Creek! I have not been able to get to the area where I planted a single seed from the initial 50 you gave me (from the fall 2014 harvest) so do not know what it has done. However, between the remaining 49 you gave me, plus the stratified ones Lee Barnes sent me last year, plus the ones Jack Johnston gave me from Blue Ridge last summer, over 40 of the total have sprouted to date. All are in large pots (wire covered) and the bulk of them are from the initial 50 seeds you (Barlow) brought me two years ago. The unstratified seeds from Blue Ridge have germinated after being in the pots for only a year or less. It has to all be beginner's luck. Many of the plants are up to 6 inches tall already and look very healthy. So far, there is no lateral growth but I suspect that is normal for the first year. PHOTOS ABOVE LEFT TO RIGHT: (1) Clint's collection of seedlings in pots that he started from seeds; (2) This single small seedling is not only the tiniest of all, but it was the only one to sprout thus far from the seeds he received via Lee Barnes autumn 2015; (3) and (4) Seedlings from the 50 seeds Connie Barlow delivered March 2015 from the fall 2014 harvest by Jack. PHOTOS BELOW: All were germinated by Clint onsite from seeds Jack obtains from the fall 2015 Blue Ridge harvest. Clint writes, "These germinated their first summer after just one winter in the ground. All my other seedlings from other seed sources were stratified prior to planting and none germinated the first year. EDITOR'S NOTE: This is a significant finding. The embryo is known to still need to mature after fruit fall; and it is well known that many tree seeds will enter quiescence (interrupting embryo maturation) if conditions become unsuitable. Perhaps the fact that Clint put the seeds into soil outdoors very soon after harvest, and if winter conditions were mild (or if frigid cold arrived only in late winter) maturation of the embryo was not interrupted. This would be interesting to explore! I had learned of the Lee, Florida nursery and had ordered 7 torreyas from them. Since they cannot ship to TN, I had them delivered to my home in Pensacola when I was there last week. Jack also ordered 4 trees and had them sent to my address. Nice plants! About 16 inches tall and about 1/2 inch in circumference at the base. Their seed source is from their "personal orchard," which is derived from trees in Madison, Columbus (GA), and Sumatra, Florida. I received 200 seeds from Frank Callahan [Medford OR source, fall 2016 harvest] and have them set out in large, protected pots. 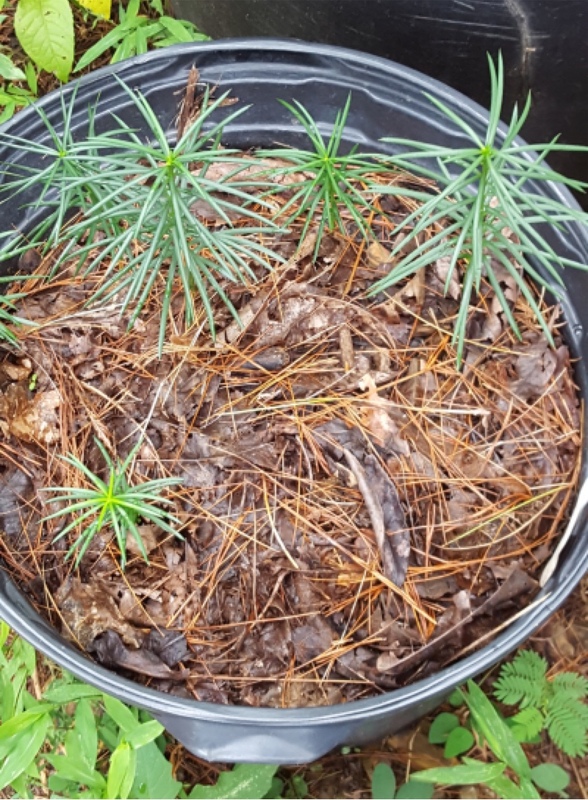 LEFT: Potted seedlings protected from deer. I am preparing to plant out on my property, the 33 seedlings I have managed to grow from the 50 seeds Connie Barlow gave me [from fall 2014 harvest via Jack Johnston]. As I plant each one on the property, I am labeling it with the source of its seed. I believe we have had success rooting SOME of the Columbus GA tree cuttings. They all looked beautiful until late spring of this year, even having put out new growth, then several died suddenly. The remainder seem to still be in good shape. I had kept most of them indoors in heated and unheated rooms, and a few were left outdoors. This week I will be moving the indoor group out into my propagation area. I have easily (have not counted) an additional 30 trees sprouted from seeds Jack Johnston gave me from Blairsville. None of the 200 seeds from the Medford OR 2016 harvest have germinated thus far. I think I have located a Florida source for seed grown Taxus floridana and hope to get some plants this fall. I am on a waiting list with 2 nurseries who anticipate having stock. I currently have 3 unsexed specimens from Woodlanders. 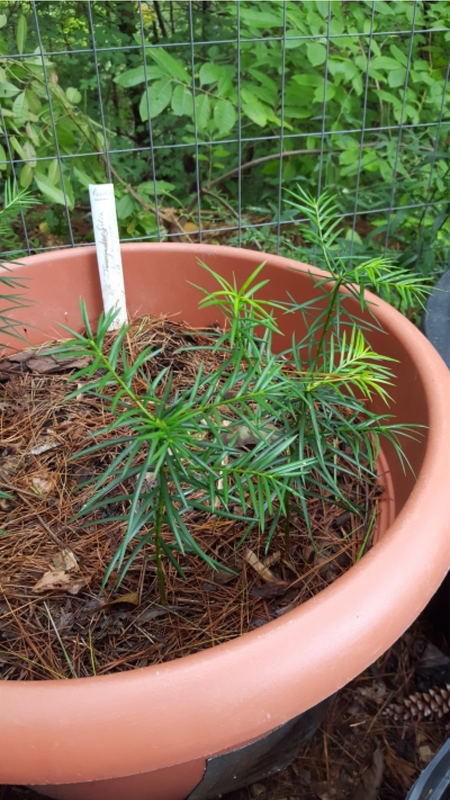 NOTE ON FLORIDA YEW: I just happened to be at my home in Pensacola when the lady from the nursery [in Tallahassee] called to let me know that the trees are in stock. They have to be picked up in person since they do not ship and cannot ship T. floridana across state lines anyway. I have a chance to come on additional T. floridana, also seed grown, from another Florida nursery that is supposed to have some this Fall. Update on the seed-grown Taxus floridana I hoped to get. Jack and I together scored most of the ones that became available (at the nursery in Tallahasse). Jack got 7 plants and I ended up with 19 with the probability of getting another 3. We took several cuttings from each plant immediately as insurance against loss. 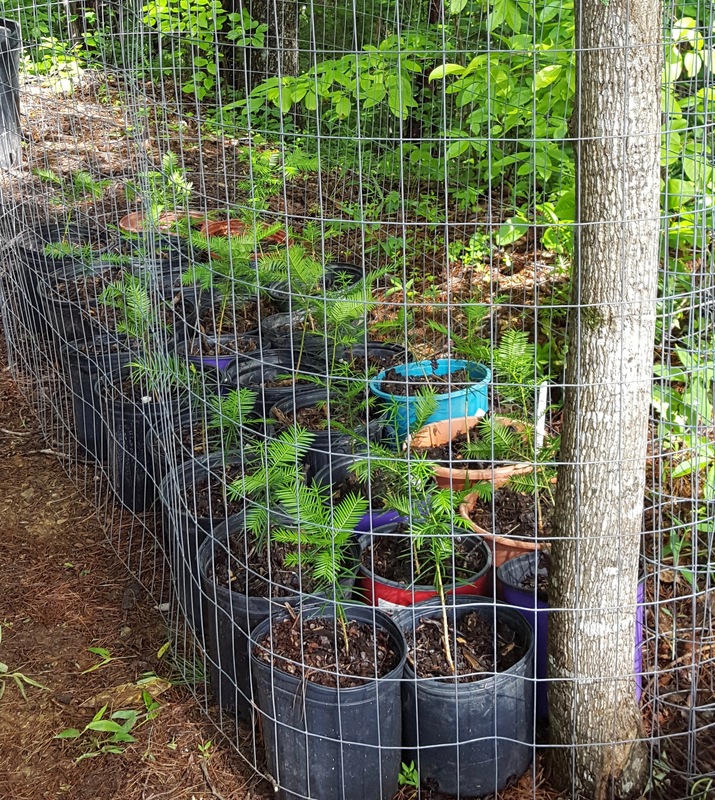 All of my Taxus floridana plantings will be surrounded by 4ft wire cages to protect from deer. 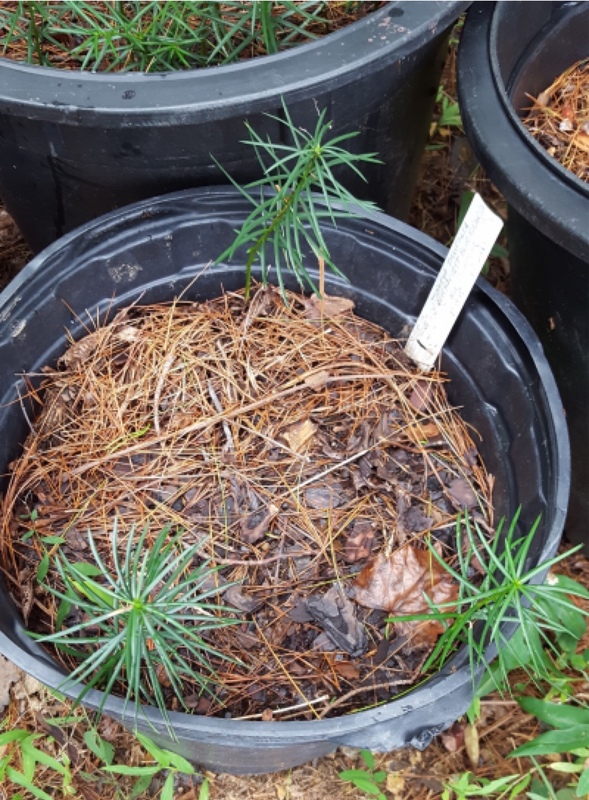 I have managed this year to purchase a total of 22 seed-grown Taxus floridana by driving to several different nurseries who all received plants from the same grower in Florida. I am supposed to be getting a few more from another nursery which has not yet received their shipment from this same grower. My total Taxus floridana collection now stands at 27! We had a very harsh winter here and I lost a lot of rare plants which were in pots. 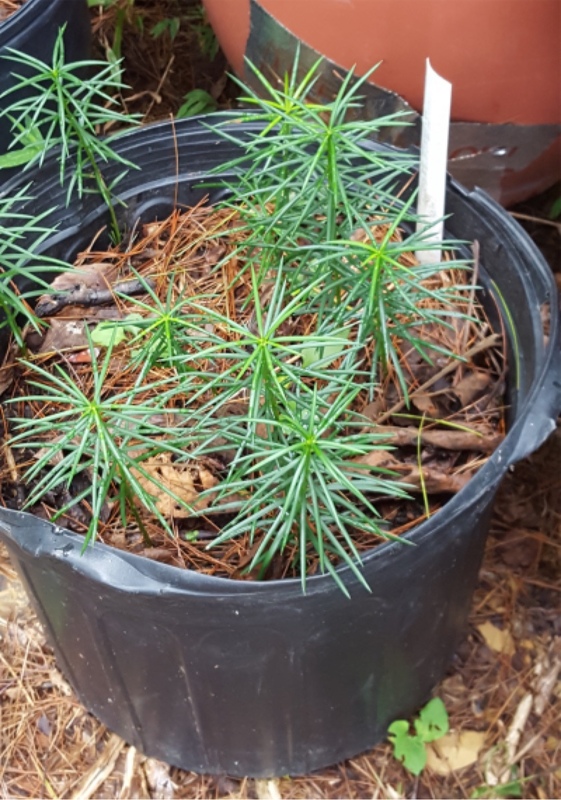 Chief among those were the 2016 cuttings Jack and I took [from the one remaining mature Torreya taxfolia in Columbus GA]. They were doing very well before the winter but it appears I lost almost all, if not all, of them. In contrast, the Highlands cuttings look to be OK. I kept most of them in the house over their first winter. And most of those were in an unheated room. A few I put into a heated space. Most look good, but I have not done a tug test to see if they have rooted. The Medford seeds [Fall 2016 harvest from 2 trees in Medford OR] have not yet germinated, but Jack says his have begun coming up. I am planning to go over to his place next week or so. A squirrel got into the Highlands seed pot [Clint and Jack collected seeds in the mature grove October 2017] and cleaned it out completely. That was the bulk of that collection. I had planted the sinkers separately and that pot was not gotten into, but so far, no germination. I hope past experiment results with sinkers are repeated since I previously had a higher success rate with floaters than with sinkers. 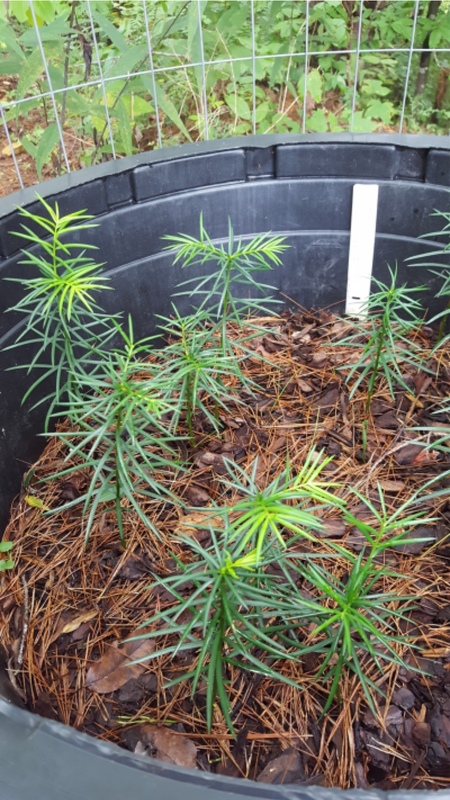 The nursery in Tallahassee FL, which had seed-grown Taxus floridana this year, would not sell to me because they are wholesale only. But by traveling all over Florida and Georgia I was able to acquire almost their entire output from their several retailers. I have acquired probably over 30. I heard from one of her retailers that she is not going to grow them again. Something ate 10 of them almost to the ground, but they are alive and coming back nicely. The predator also ate 5 T. taxifolia similarly. Not sure what got them, since I had them all in "protective custody". The enclosure was too small for a deer to get into. Jack thinks it was a groundhog, since they can climb, and I do have a groundhog on the property. I sprinkled mothballs around the survivors and have had no further predation. 1. ROOTED BRANCHLETS: In retrospect, the cuttings may have survived if I had packed mulch all around the set of pots containing rooted branchlets.... Jack lost a lot of things in pots too. I lost 4 Elliottia, 5 Ashe magnolias, 7 Chapman's rhododendrons and other less rare things. It was an awful winter. 2. OUTPLANTED TORREYAS: My outplanted Torreyas [under natural forest canopy] are fine. The ones far from the house are all in 4 ft wire cages as will be the yews. (It has probably gotten too late in the year to outplant the yews now.) I know not to amend soil around outplants very much. So I usually just throw in some of those moisture-holding crystals, since my outplants are far from a spigot. (I have occasionally carried jugs of water to distant outplants when rain is scarce). Also I throw in a good amount of gravel or preferably shale pieces. Jack thinks this makes the site less inviting to tender noses of burrowing critters. 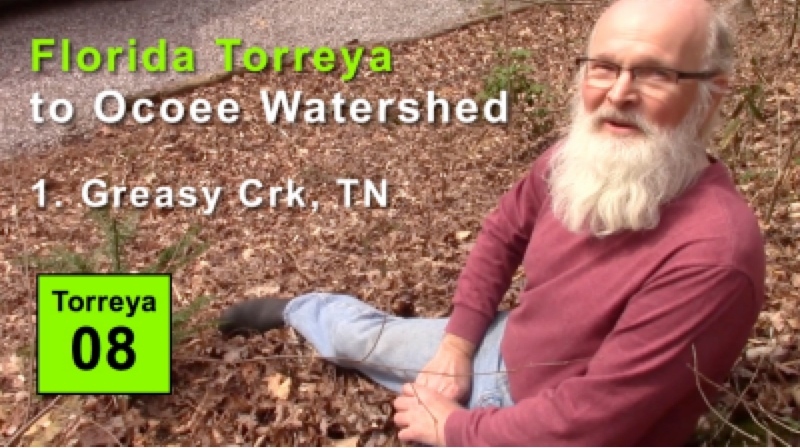 March 2019 Site Visit by Connie Barlow: I visited Clint March 18 and video-documented the tremendous growth and health of his out-planted Torreyas. I also visited his fenced area of potted seedlings he has been germinating from seed. I captured a lot of video of his results and will post the url to that video once I edit and upload it to youtube.